Baby washcloth corsages can be an adorable addition to a baby shower for the mother-to-be, the father-to-be and even for the soon-to-be grandparents. The corsages can also be used as a shower favor for guests. These decorative gifts are easy to make, can be customized in any color and the corsage-maker can even add a little something extra in the center of the corsage for the recipient to discover later. Smooth out a baby washcloth on a table. The corsages can be made with inexpensive washcloths, but for a more elegant-looking corsage, use a high quality baby washcloth with a decorative embroidery around the edges. If you are making several corsages for party favors, consider using different color washcloths for a colorful display. You can use pink, yellow and white washcloths, and for boys you can use blue, green and white washcloths. Fold the washcloth in half and then in half again. For a more personalized touch, before folding the washcloth, write a small note of well-wishing on the washcloth with a fabric marker and allow it to dry first. Place any little extras you would like to add on the bottom edge of the folded washcloth. Items that you could add to the corsage include money, gift certificates or miniature scroll keepsakes. Roll up the washcloth starting at the bottom edge where any gift item was placed. Make sure the washcloth is wrapped tightly. Wrap the bottom half of the corsage in floral tape to keep it secured. Use a hot glue gun to attach decorative items, such as baby's breath and leaves to the corsage and allow the glue to dry. Next, cover the glued area with a little bit of extra floral tape. Use the hot glue gun to attach a large silk flower to the front of the corsage, approximately half way through the floral tape, and allow the corsage to dry. Attach a safety pin to the back of the corsage to make a pin-on item, or make a small hole in the back of the corsage to thread a ribbon through. 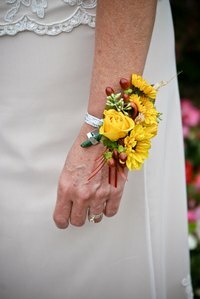 The corsage can then be tied around the recipient's wrist.